From the second day onwards, right after the Pabirik Festival, it was raining from time to time and heavy rain welcomed us early in the morning of the third day, the day we were to travel to the Calaguas Islands and camp overnight. A phone call confirmed our worst fears – the trip to the Calaguas Islands was cancelled due to rain and high waves. 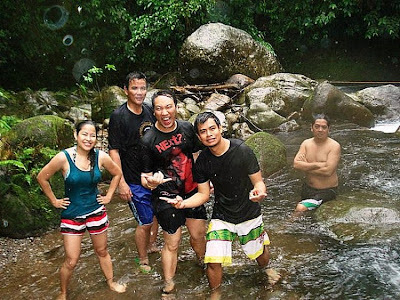 Regretfully, we switched to Plan B – a hike to Nakali Falls in San Lorenzo Ruiz town, rain or shine. We were all driven to the municipal hall where two guides were assigned to us by the mayor. Amable Miranda and Roufel “Raffy” de Vera of the Provincial Tourism Office also accompanied us. As it was still early in the morning, we expected the round trip trek to the falls to be over in four hours and that we would be back at the municipal hall by lunch time. How wrong we were. Regretfully, for the trek, we only brought bottled water and some snacks we bought at Daet. The trail was understandably wet and muddy due the previous night and today’s rain and I regretted having worn slippers instead of sandals which, more often than not, got stuck in the muck. The uphill, downhill and sometimes flat trail brought us hiking through coconut and pineapple plantations, boulder-strewn river banks as well as crossing the Matacong hanging bridge. 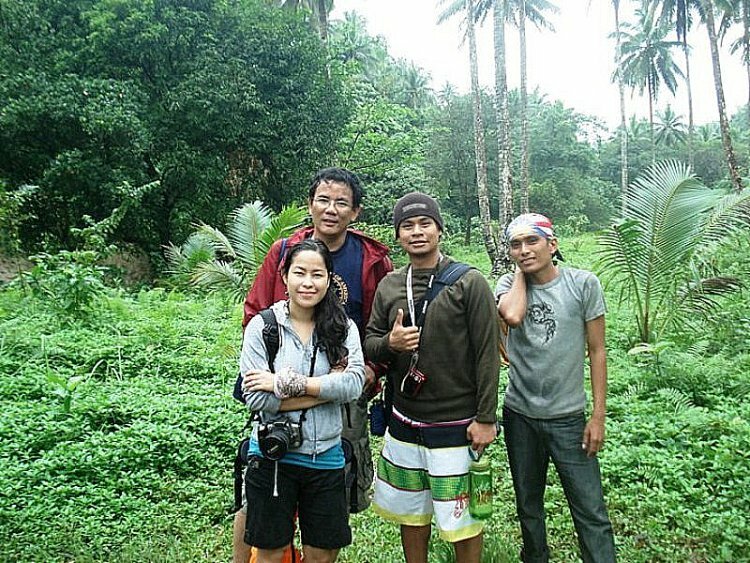 I also made a wrong turn along the way, hiking alone for some time before retracing my steps and catching up with them. A number of times, media colleague Lito Cinco wanted to quit, uttering his famous line “This is where I draw the line” a number of times, only to continue on his way, goaded on by Kara Santos. We all finally drew the line when we neared the falls as the strong river current, even with a guide rope thrown across, prevented us from hurdling the final leg. Even if we did, heavy rain would have prevented us from using our cameras much less get a good, clear shot. We just contented ourselves with bathing the cool river waters. It was now late in the afternoon and we hadn’t eaten lunch, just snacks, water and the juice and meat of some coconuts plucked from trees at a shack where we made a stopover and rested. Paracale was one of three parishes (the others were Daet and Vinzons) celebrating the quadricentennial of their parish’s foundation, an event which I, event organizer Bernard Supetran, blogger Mark Vincent Nunez and mediamen Kara Santos (Sunday Inquirer) and Joselito “Lito” Cinco were to cover. Our second day in the province was, coincidentally, also the high point of the town’s Pabirik Festival. We arrived just as the street dancing parade was making its way into the town’s gym for the final judging. We first dropped by the town’s Spanish-era Church of Our Lady of Candles which was reconstructed between 1888 and 1898 under the direction of Fr. Jose Cardenoso, the last Spanish priest to serve the parish. After that, we proceeded to the gym to watch the contingents perform. 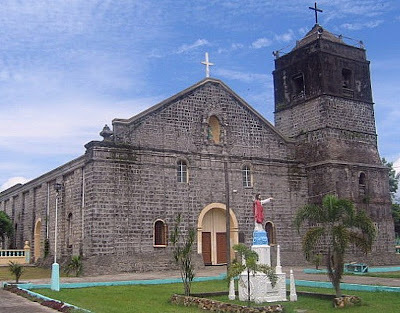 Mayor’s Office: Municipal Hall, Poblacion, Paracale, Camarines Norte. Tel: (054) 449-1008. The Bulawan Museum, known as the “Golden Museum,” is located within the sprawling Provincial Capitol. 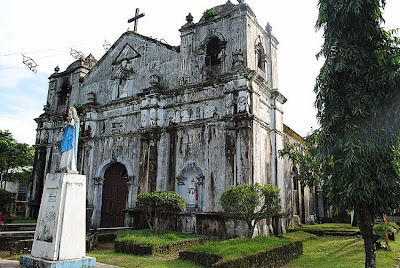 A window into the province’s rich history and culture, it has a collection of old photos; World War II memorabilia (weapons); portraits of past governors; and busts of local heroes (Gen. Vicente Lukban, Wenceslao Q. Vinzons, Sr., Capt. Tomas M. Zaldua and Lt.-Col. Francisco D. Boayes). It also displays family heirloom pieces (including a collection of kitchen utensils such as silver spoons, fork and butter knife of the late Gov. Miguel Lukban), traditional clothing; a numismatic collection of old coins and paper currency; a collection of shells; gold jewelry; antique household appliances, paintings and a boya (a round floater attached to a net to keep it afloat). Museo Bulawan: Provincial Capitol Complex, Daet, Camarines Norte.